In the beginning, we asked our vendors to increase the price that we paid for each item to reflect paying the artisans an extra 30% of what they made on our items. We are now working with each vendor to break out the cost of each item into the labor cost, material cost, overhead and profit. We are then raising our prices if we can and increasing the amount that we pay artisans by whatever we can. In 2010 all orders that we place will have a material and labor cost form completed which shows for each items how much extra we are paying. But the minimum will be 30% over what they would make working for a non-fair trade company. This is fairly hard for us to monitor and we are now paying someone to interview the artisans so we can gain a better understanding of their overall satisfaction. We’ve posted a few of these interviews on our website and we’re going to add more each year. I’m 100% confident that the extra amount of money that we build into the cost of the product for extra labor is paid out. But I also wanted to do more. 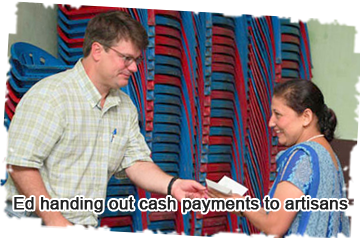 At the end of each year, if we have a profit, we pay this out to the artisans directly in the form of a cash payment. 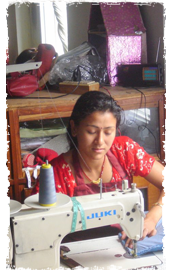 Since 2004, we have only had one profitable year, 2007, in which we paid out $5,000 to the artisans. In 2008, 2009 and 2010 we lost money. Our revenue was down in 2008 and 2009, and we kept our cost at a bare minimum to avoid larger loses. In 2010, we invested in marketing and saw a general increase in sales, but experience a fairly large financial loss. Our goal is to make a small profit in 2011.